Florists design and make up floral arrangements for sale to the public. Order and purchase flowers and other floristry items from wholesalers or growers. Display flowers, plants and ready-made flower arrangements. Water plants, and cut, condition and clean flowers and foliage for storage. Confer with customers, e.g. regarding the price and type of the arrangement desired, to suggest suitable flowers, and to fix the date, time and place of delivery. Plan floral arrangements according to customers' requirements or for general sale, e.g. utilising knowledge of design and properties of materials. Arrange, trim and secure bouquets, wreaths and other items using trimmers, wire, floral tape, foam, etc., following own plans or standard design patterns. Wrap and price completed floral arrangements, and arrange for delivery if necessary. Decorate or supervise the decoration of buildings, halls, churches or other facilities for parties, weddings and other occasions. 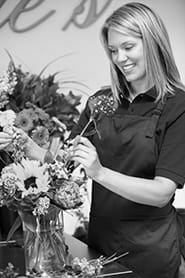 Inform customers about the care, maintenance and handling of flowers, plants, foliage and other items. Perform office and retail service duties, such as keeping financial records, serving customers, answering telephones, selling flowers, plants and giftware items, and receiving payments. Plan and manage a budget, and hire and supervise staff.